This section introduces you to benchmarking. Benchmarking is the process of profiling clinicians by comparing their observed outcomes against expected outcomes. Advanced learners like you, often need different ways of understanding a topic. Reading is just one way of understanding. Another way is through writing. When you write you not only recall what you have written but also may need to make inferences about what you have read. The following questions are designed to get you to think more about the concepts taught in this session. Are physicians in Florida more efficient than physicians in Oregon. Explain your answer. Give your reservations about your conclusions. In the following questions assume that we have followed two clinicians, Smith and Jones, and constructed the decision trees in Figure 1. What is the expected length of stay for each of the clinicians? What is the expected length of stay for Dr. Smith if he were to take care of patients of Dr. Jones? 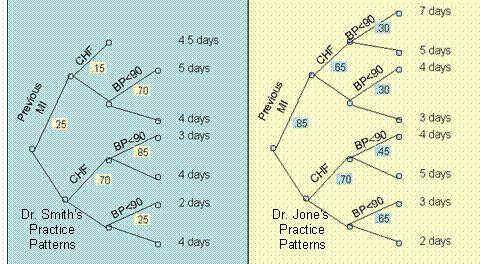 What is the expected length of stay for Dr. Jones if he were to take of patients of Dr. Smith? Send your response by email to your instructor. Include both the question and the answers in your response. Include your contact information. Copyright © 1996 Farrokh Alemi, Ph.D. Created on Sunday, October 06, 1996 4:20:30 PM Most recent revision Monday, February 17, 1997 4:42:41 AM. This page is part of the course on Quality.